Does your spouse's behaviour sometimes make you cringe? Don't resent your differences - understand them! This insightful book will help you resolve personality conflict and appreciate what's unique about your mate - and yourself. About "Personality Plus For Couples"
The best-selling author of Personality Plus and Personality Plus for Parents now shows couples how to apply the personality principles that have made Florence so popular. Husbands and wives will understand why they act the way they do and how they can best respond to each other. Personality Plus for Couples gives husbands and wives: * a personality profile test to identify their personality types * the trademark characteristics of each personality type * ways to resolve hot conflicts that arise between spouses * what to expect if you marry someone of the same type, someone of the opposite type, or someone with a compatible personality type Littauer offers pages of stories and practical insight about how to approach each personality differently. When husbands and wives care enough to understand what makes the other tick, they can celebrate each other?? 's individuality and build a marriage that lasts. Does your spouse's behavior sometimes make you cringe? She needs to lighten up. He needs to help out more. She thinks fifteen minutes late is on time. He thinks showing up on time is late. The two of you do and see things differently, but that doesn't mean one is right and the other must be wrong. Rather, as expert Florence Littauer shows, your differences are a matter of personality. 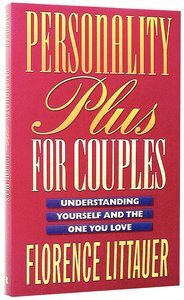 Personality Plus for Couples will help you resolve personality conflict and appreciate what's unique about your mate--and yourself! Using her proven principles from Personality Plus and insightful examples from other couples, Littauer offers husbands and wives: a personality profile test to identify their personality types the trademark characteristics of each personality type ways to resolve hot conflicts that arise between spouses what to expect if you marry someone of the same personality type, the opposite type, or a compatible typeDon't resent your differences--understand them! Allow and encourage each other to be who God created you to be, through Personality Plus for Couples. Florence Littauer is the author of numerous books, including Personality Plus, which has sold more than one million copies. The president of CLASS Speakers, Inc., Littauer travels nationwide with her husband, Fred, teaching about emotional health at seminars and retreats. She lives in Cathedral City, California. The popular author of numerous books, including the best-selling Personality Plus, Florence Littauer has taught leadership seminars for twenty-five years and is the president of CLASS Speakers, Inc. She and her husband, Fred, travel internationally conducting seminars and retreats. Littauer lives in Cathedral City, California. 1. What Are The Personalities? Customer Reviews For "Personality Plus For Couples"